He loves animals as much as I do, and his support has made it possible for us to adopt all these lovely creatures! 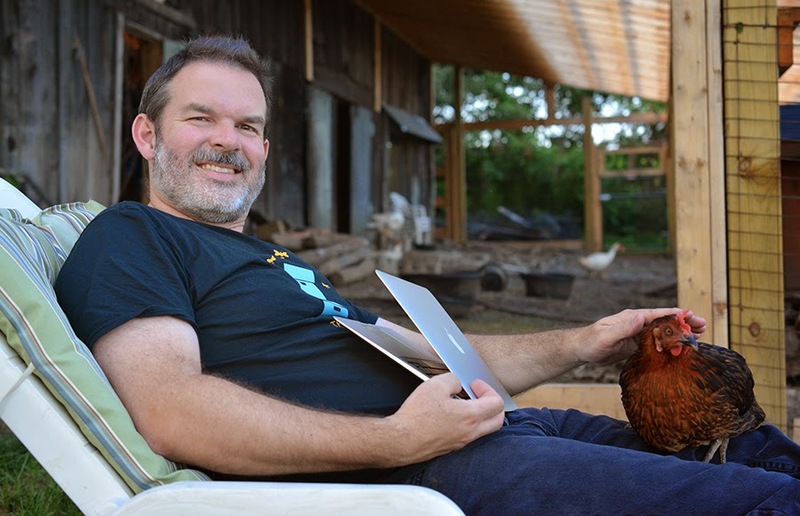 Charlotte the hen loved Gordon as much as I do! 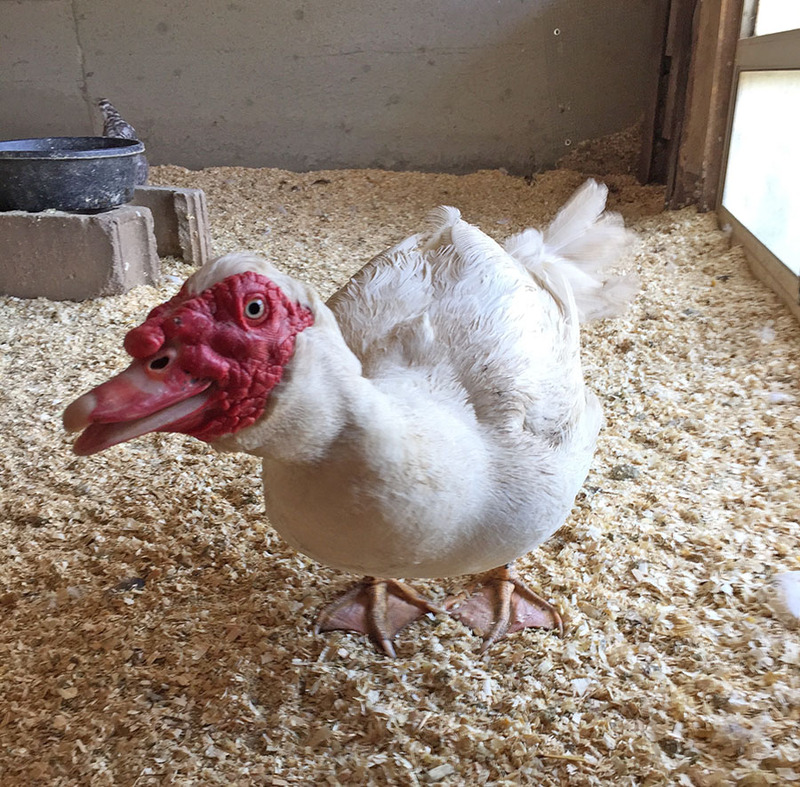 Our sweet chicken shuffled off this mortal coil in February 2015 at the age of 5-1/2. Our "Vizsladorable" born in 2002. He was a Lab/Vizsla cross who came to the farm with his buddy Sophie in 2007. We sent Tristan off to be with his buddy Sophie on October 4, 2016 at the ripe old age of 14, but he will always be part of the farm. 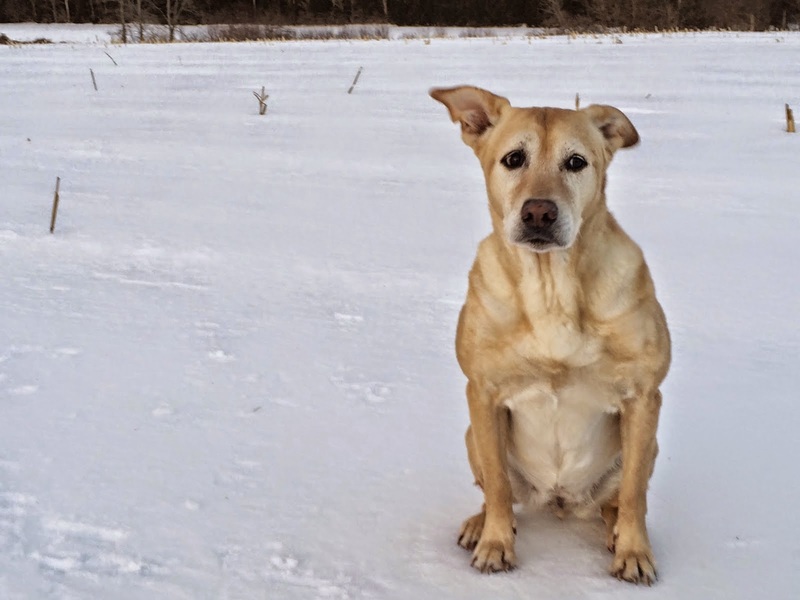 He and Sophie are now buried in our woodlot, where they had countless happy walks. Our dear Sophie left us on April 17, 2014 but she will always be in our hearts. She was such a big part of our farm life for almost seven years. I think she's still keeping an eye on us all from somewhere out there, while she nags her brother Tristan. I hope there are lots of squirrels in doggy Heaven. 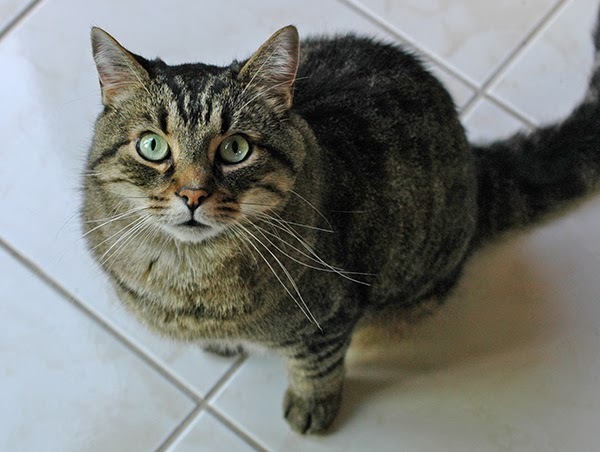 Julius showed up at our back door in Nova Scotia in 2000. Never left. 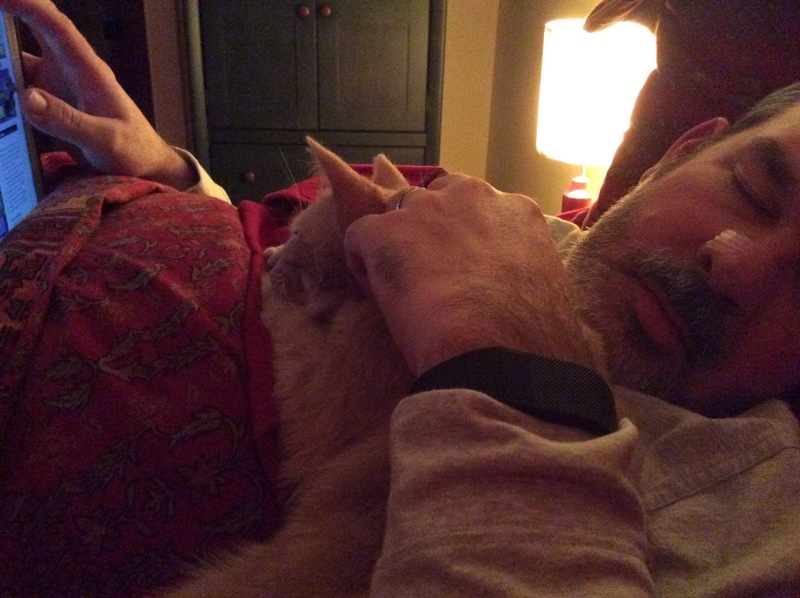 We lost Julius on November 16, 2015 to kidney failure. He was a beautiful cat who will always be in our hearts. Born in 2007. 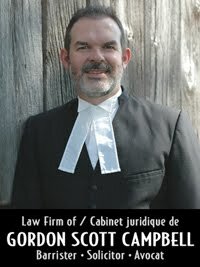 We adopted him from the Stormont, Dundas & Glengarry OSPCA in the fall of that year. 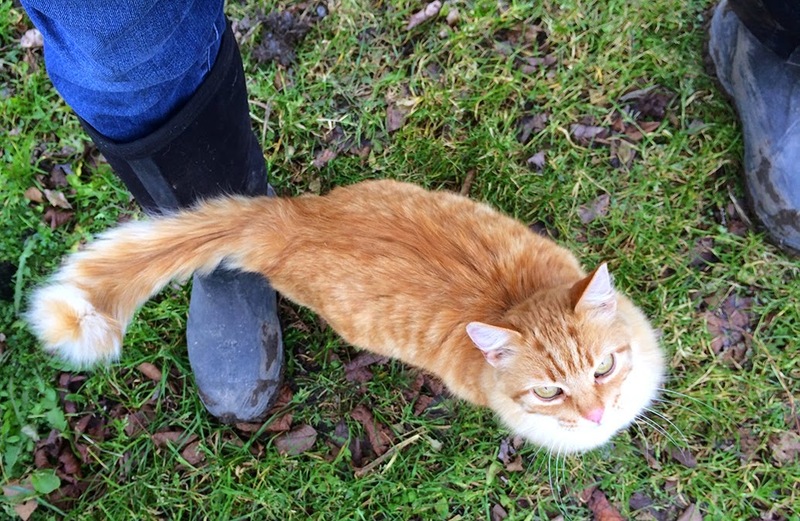 He has three legs, because some idiot put out a leghold trap in the city of Cornwall. Some kind soul rescued Alex and brought him to the shelter, where his rear left leg was amputated. He sucked us in six weeks later. Showed up at our back door late one night in September 2008. She was a tiny kitten then. She is a tiny perfect cat now. She's Alex's one true love, and he feels the same way about her. Sweetest cat I have ever had the privilege of sharing a home with! 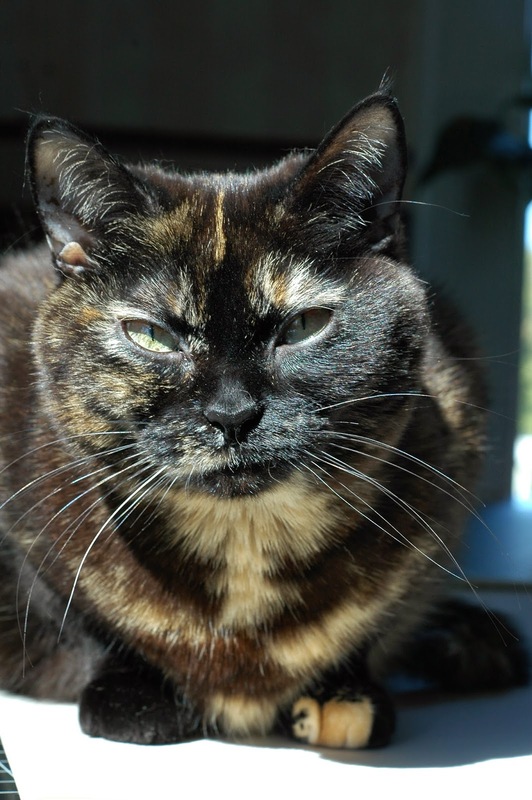 I heard her meowing in the yard at 4:45 one bitter January morning in 2012. The temperature was -20C, the windchill -29C. Clearly she had been dumped. 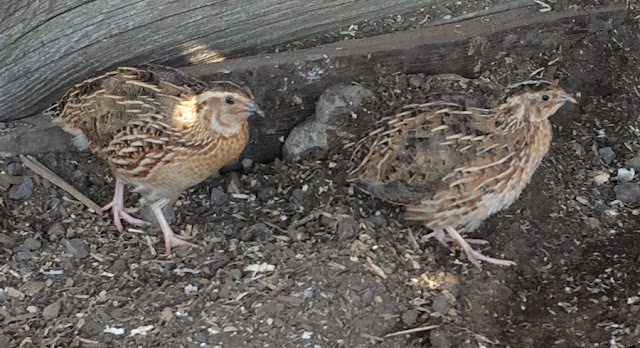 I spent 24 hours chasing her around before my friend and I finally trapped her in the woodpile in our granary. With a gloved hand, I pulled out a screeching kitten. Five minutes later, we were cuddling in the warm house. She has turned into a real beauty, inside and out. 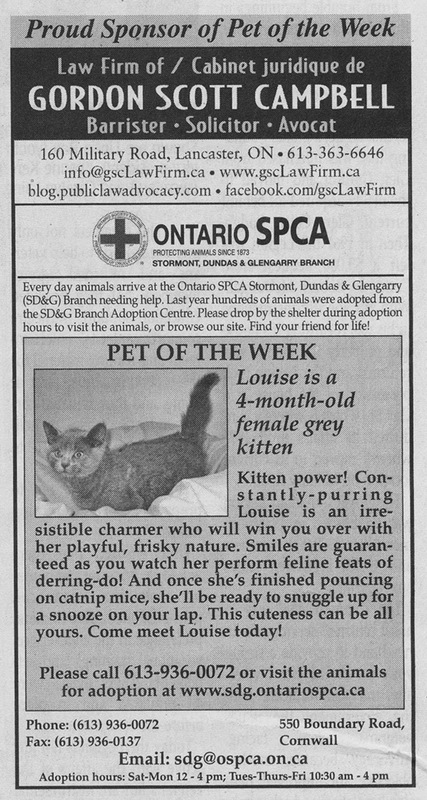 Guess who adopted her before the ad even went to print? She still purrs constantly. Her "Gotcha Day" was September 27, 2013. 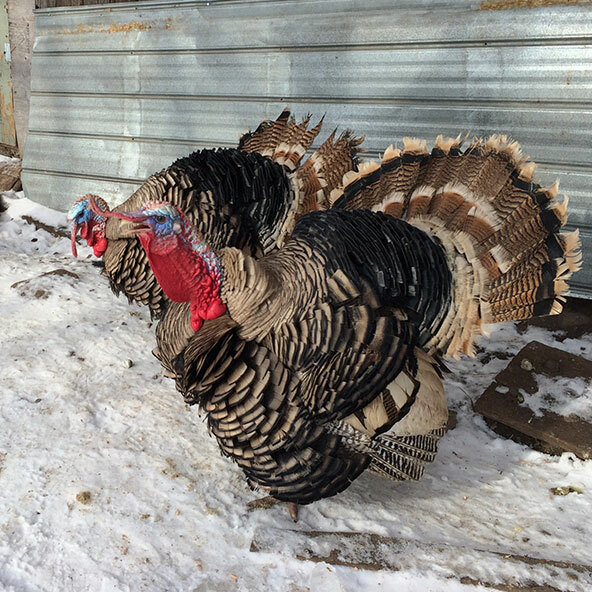 These two twits are Richard and Carlton the Narragansett turkey boys. They arrived via the SD&G OSPCA on March 9, 2014. Their owner kept snakes to which he fed turkey chicks, but for some reason, he got attached to these two and let them grow into magnificent male turkeyhood. However, the turkeys took to running around the Cornwall, Ontario neighbourhood they lived in and flying up on people's roofs. And since turkeys perhaps aren't the best city pets, their owner kindly brought them to the OSPCA, where the staff have us on speed dial under the label "SUCKERS." WS we took in these two terrible Toms, we quite like them, but most of the people who help us with barn chores would like to see Richard & Carlton on the Thanksgiving dinner table (not gonna happen!) They do have a rather annoying habit of sneaking up behind you and pecking the backs of your knees, which is particularly unpleasant if you are wearing shorts. Sadly, we lost Richard in 2018, but Carlton continues on! 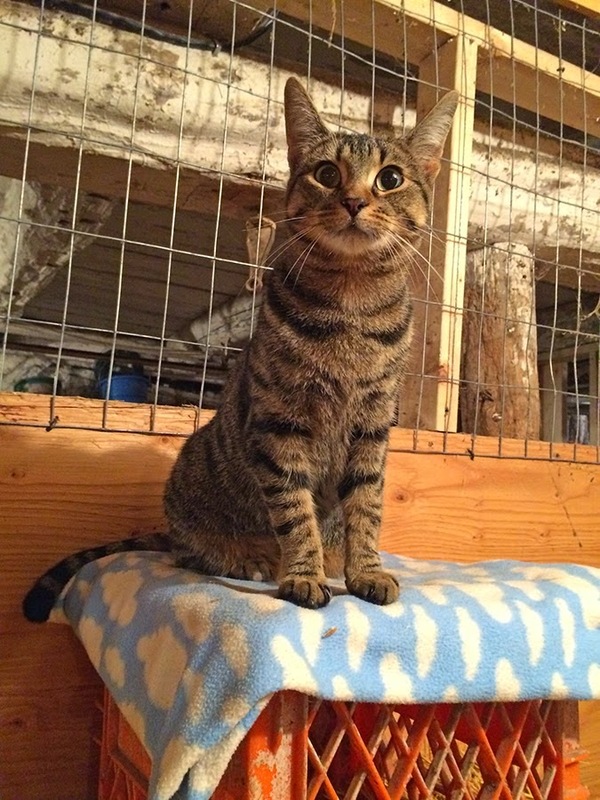 This amazing cat showed up in our barn on Saturday, May 10, 2014. Now he's neutered and living the good life in our house. He was between 6 - 8 months old when we found him. Super adorable cuddle-monkey with the biggest, er, cat family jewels we've ever seen. 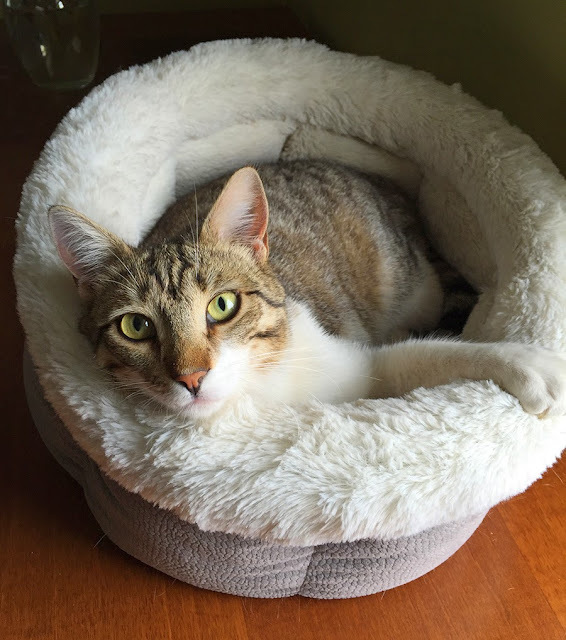 Until his neutering, we called him "Mr. Giant Nut Man." We are sure he was dumped here. He latched onto us immediately and has made himself right at home! Ophelia came to us from the OSPCA in February 2014. She is a pot-bellied pig. What none of us knew was that she was pregnant. 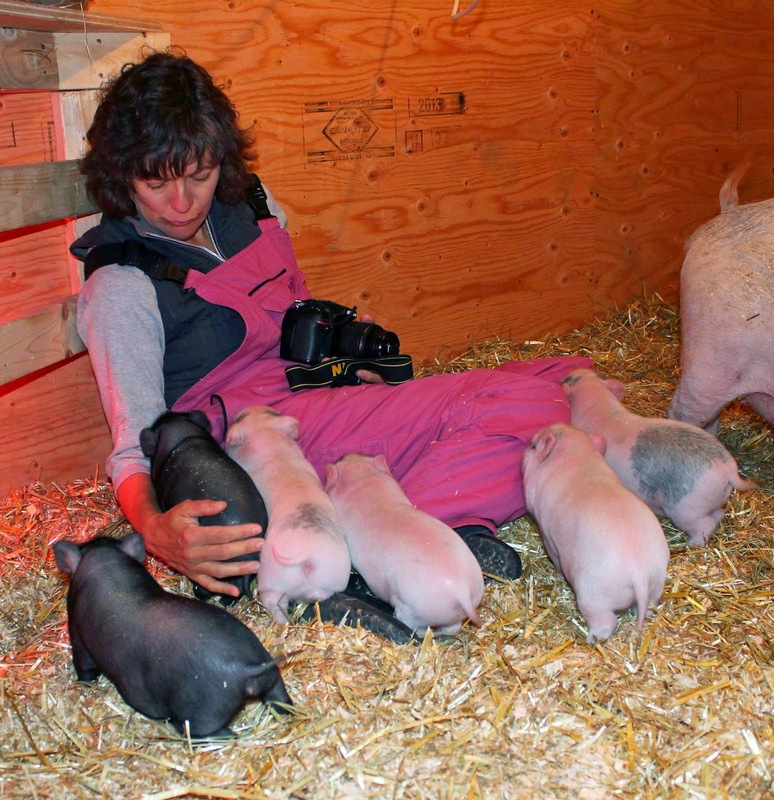 She gave birth to seven adorable piglets on April 20, 2014... Easter Sunday! Sadly, despite our vet's best efforts, the little runt succumbed to pneumonia a couple of week later. But the other six are thriving. JERSEY! Jersey was born May 24, 2014. The SD&G OSPCA shelter manager sent me a message asking if we knew anyone who wanted a piglet, knowing full well who that "someone" would be. Jersey has been a wonderful addition to our little herd. 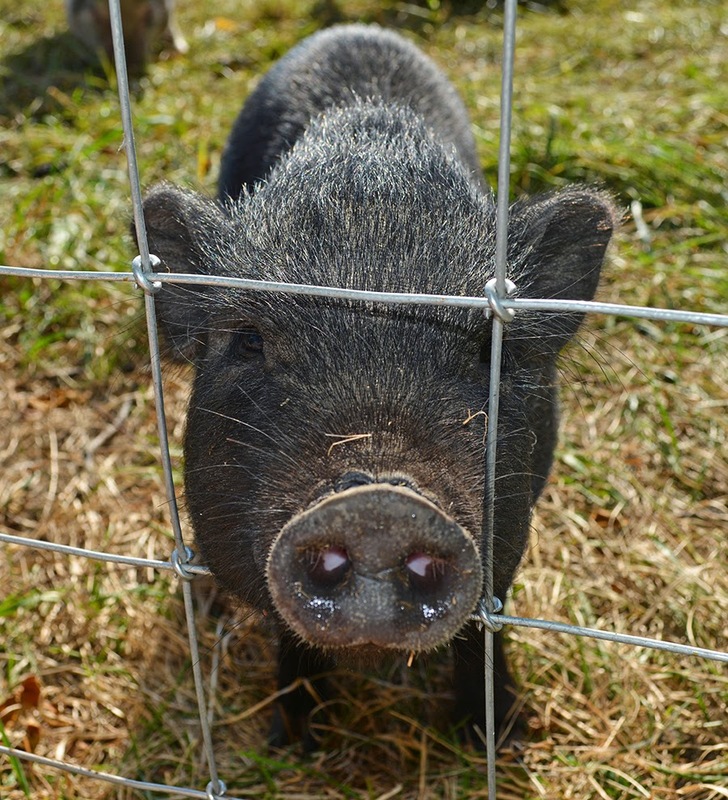 Sweetest piggy ever! 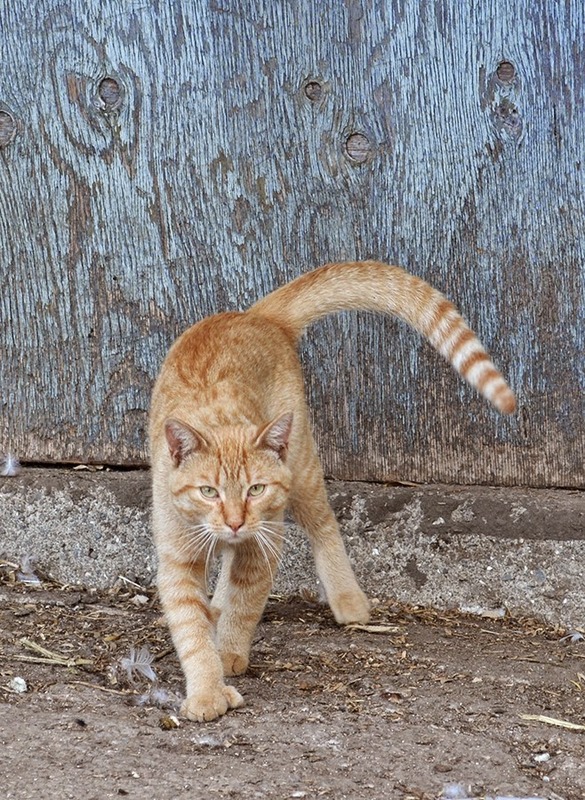 And then there's the ever-expanding barn-cat collection. He was initially terrified of me but is now my best buddy. 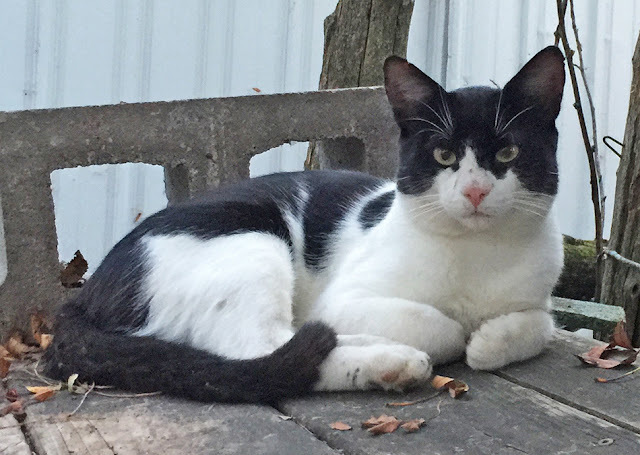 He's a wonderful polydactyl fellow who follows me absolutely everywhere when I'm outside! MISSY and LIONEL! 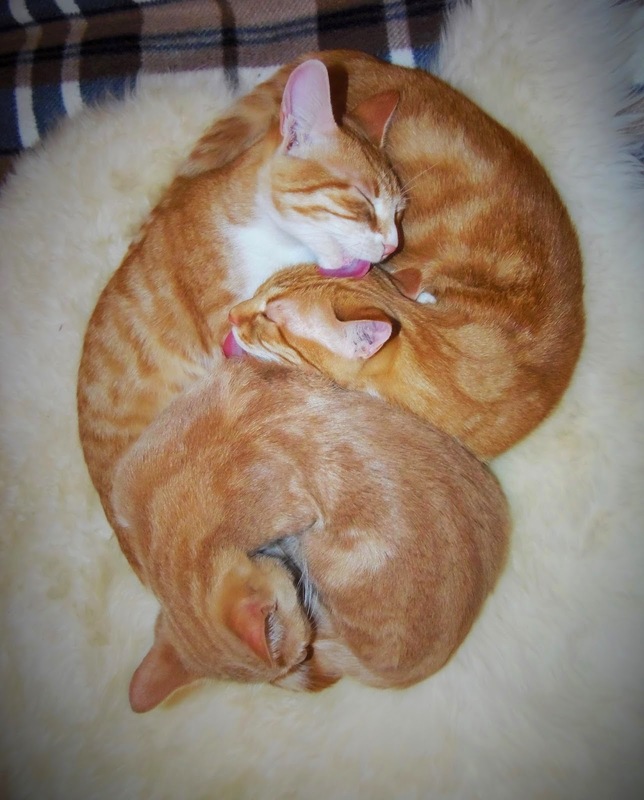 We adopted these two lovely felines from our friends who needed to rehome some barn cats. Here they are in their temporary quarters, the old pig pen, as they acclimatized to their new home. Sadly, Lionel was only with us for 13 brief days before he succumbed to illness on October 5th, 2014, despite valiant attempts by our vet to save him. He will never be forgotten. 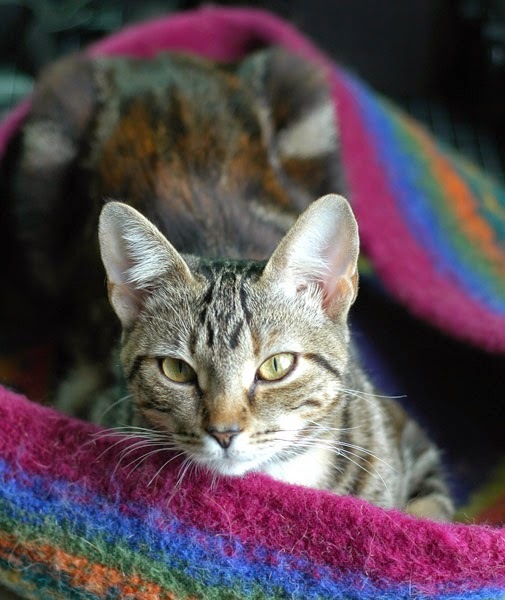 A wonderful, sensitive, affectionate cat with a beautiful chirpy purr. Missy is petite and adorable with a cute little tail! MOOTIE and PIP! 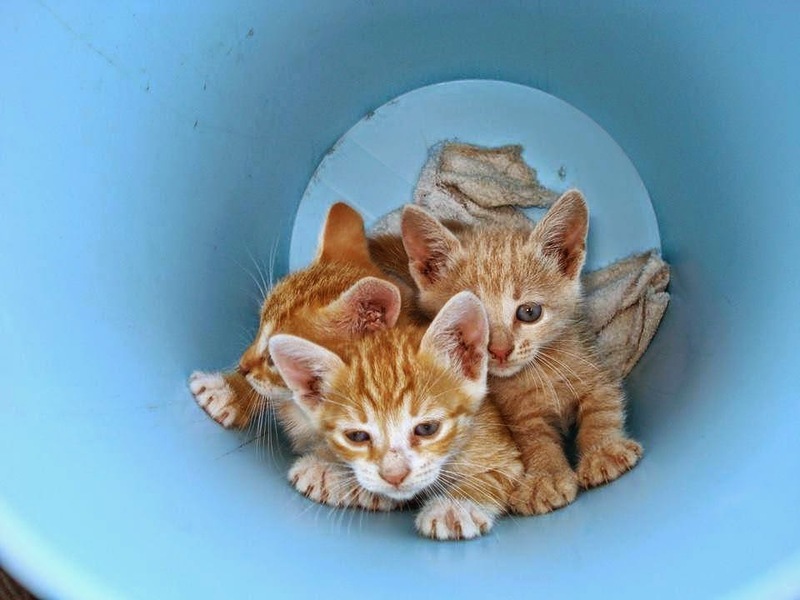 Their owner had developed health issues that meant she had to sell her home and move in with friends, and she couldn't take her cats with her. 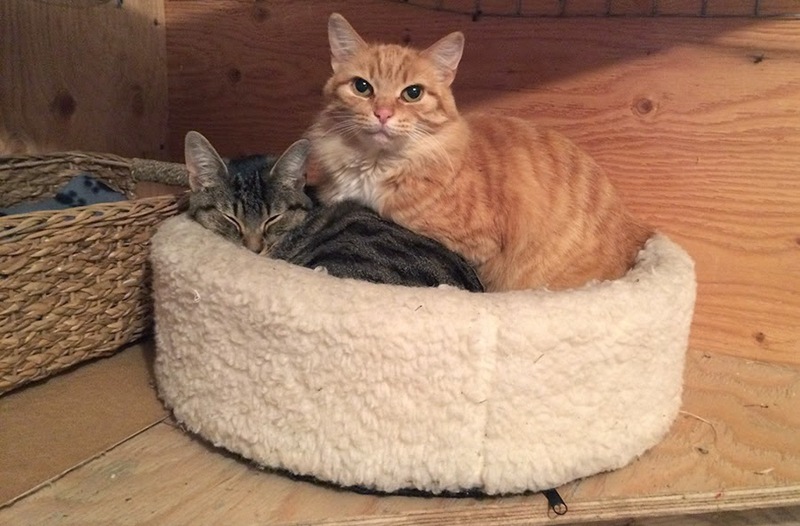 My friend Deb over at Just Cats had been their cat-sitter and thought that maybe we could offer these two lovely girls a home in our barn. Which we did! Pip is a bit over a year old. She's feisty, curious, adventurous and sweet! She likes to explore on her own but curls up with her buddy Mootie at bedtime every night. UPDATE: These two are failed barn cats and now live in our house! Mootie is about 8 years and has had a really tough time in life. She sat in a shelter for five months, passed over and labelled "unadoptable" because she was so shy, and would not allow anyone to hold her. As it turned out, she also had terrible gum disease that was causing her immense pain. Finally, a kind lady named Susan took her home. 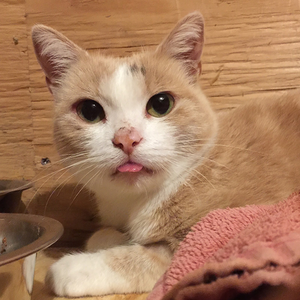 All of Mootie's teeth were removed, which made her a much happier cat. Pip showed up as a sickly kitten shortly after Mootie was adopted, and Susan took her in as well. Susan was very sad about having to find a new home for her beloved cats. 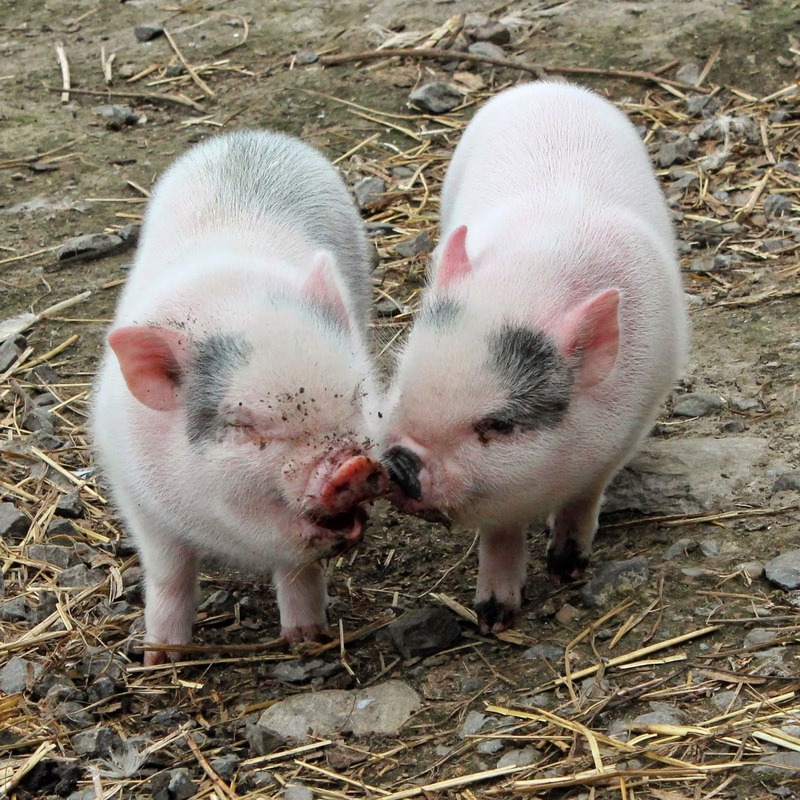 I'm so happy Deb thought of us, because Mootie and Pip are wonderful and have been a great addition to our farm. Mootie loves nothing more than to be brushed, and I oblige her on a daily basis. She has been steadily coming out of her shell, and I've been working hard to earn her trust. She in particular is very dear to me. 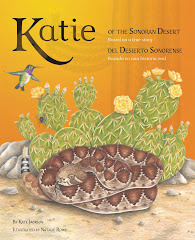 She suffered a lot in life before finding a loving owner in Susan. Mootie likes hanging out with Missy in the daytime. The two "older ladies" of the barn seem to enjoy each other's company. Mootie can also be found rolling in the catnip patch with Pip! We lost Mootie on July 23, 2018 to a laryngeal tumour. She was so very loved. We will always miss this special cat. 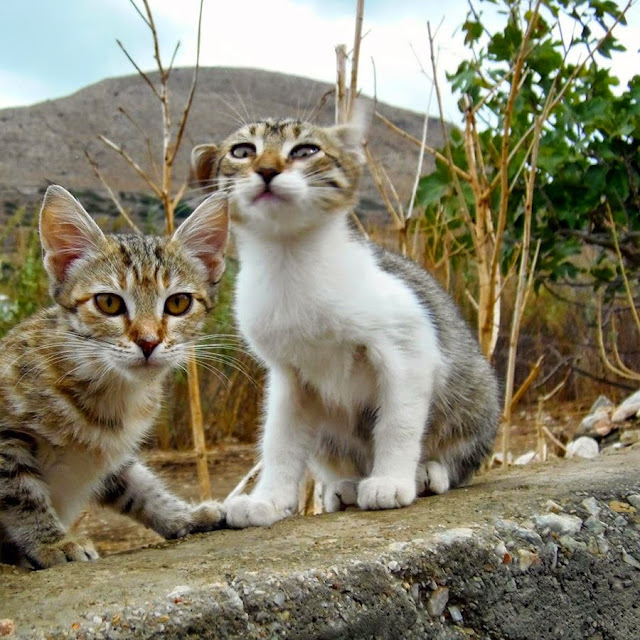 In September 2013, they were left in a dumpster on a Greek island, at just two weeks old! 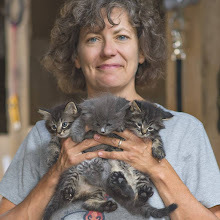 My friend Joan (who took this and the other group photo that follows) took them into her cat rescue, God's Little People. 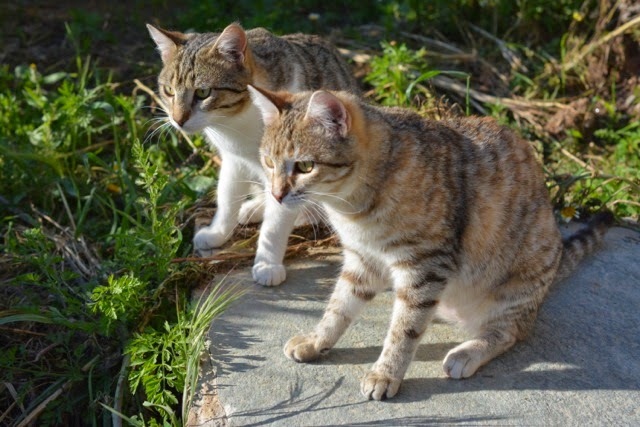 We asked to adopt them, and after working on the logistics for six months, Joan's husband flew with them to Montréal (on his way to New York). The border agent at the airport was so touched by the adoption story that he waived all the importation fees for the trio! They have settled in nicely. I just adore this photo Joan took of them some time back. The sheepskin has been with them since they were two weeks old, and came with them to Canada. 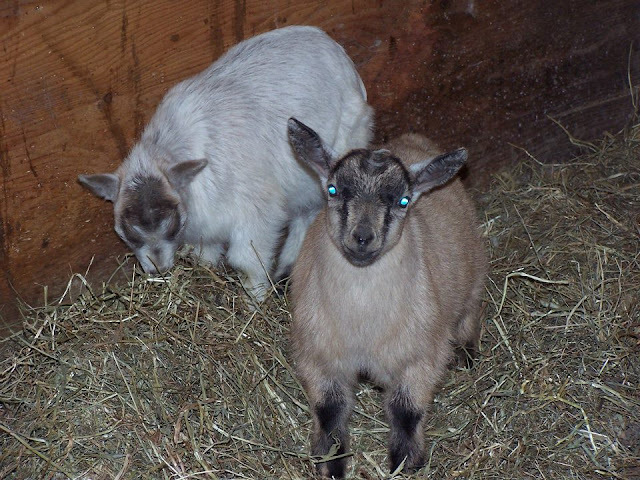 FINNEY and ESME came to us on November 13, 2014. We adopted them through the Stormont, Dundas & Gengarry OSPCA. They were seized from separate situations, but bonded in foster care, so we adopted them both. Esme is a lovely paint (born 2002) who is blind in her left eye. She is so sweet and such a good girl! Finney is a chestnut gelding (born 2011) and what my mother would have called a "cheeky monkey." But he's also very sweet and we are teaching him some manners! These two are a wonderful addition to our farm. 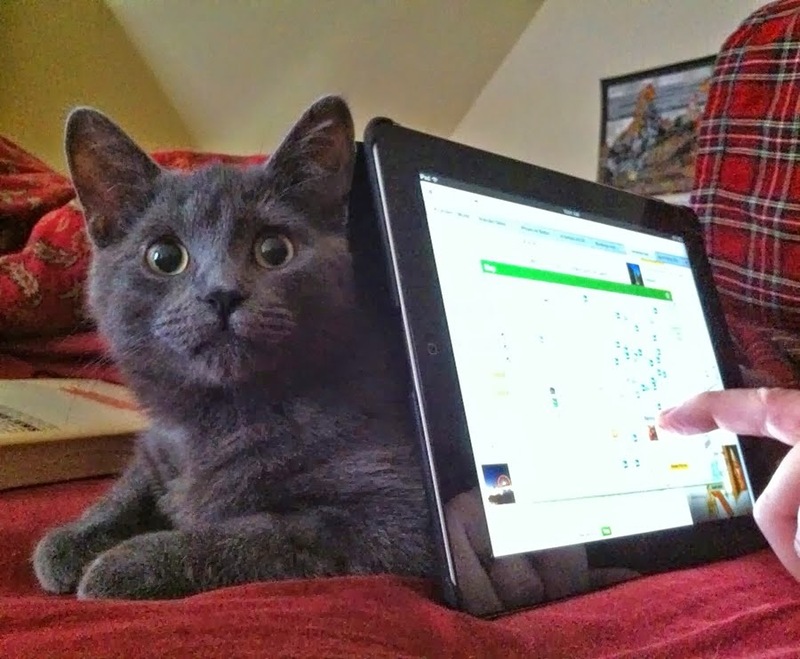 And then, on December 14, 2014, we adopted Lenny from our local animal shelter. Lenny is a blind, 27-year-old (!) 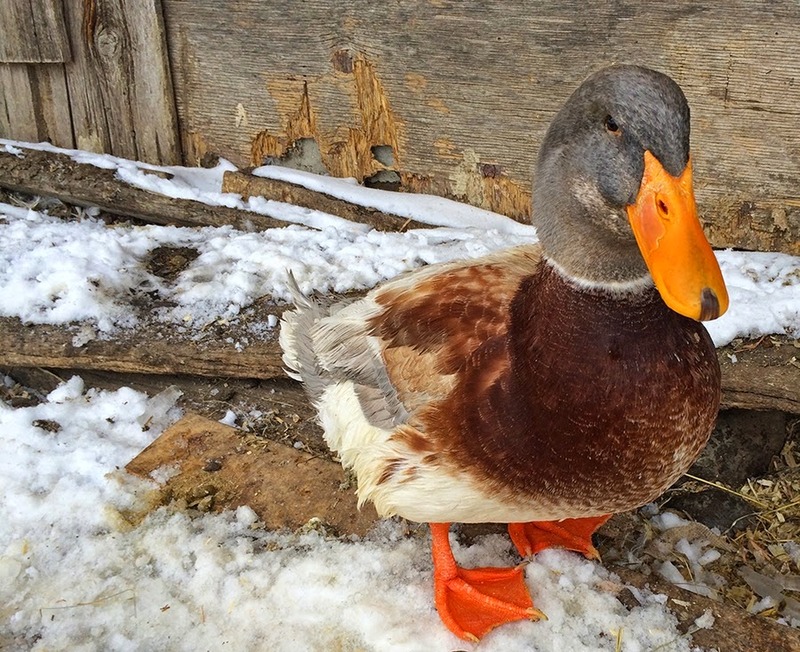 farm mallard. He was owned by an elderly farmer and his wife, who had to give him up due to illness in the family. I was told that Lenny like a banana in the morning, grain in the day, and some lettuce at bedtime. We are doing our best to oblige him! He seems like quite a happy fellow and we were pleased to add him to our animal family. Update: Sadly, we lost Lenny on September 10, 2015. 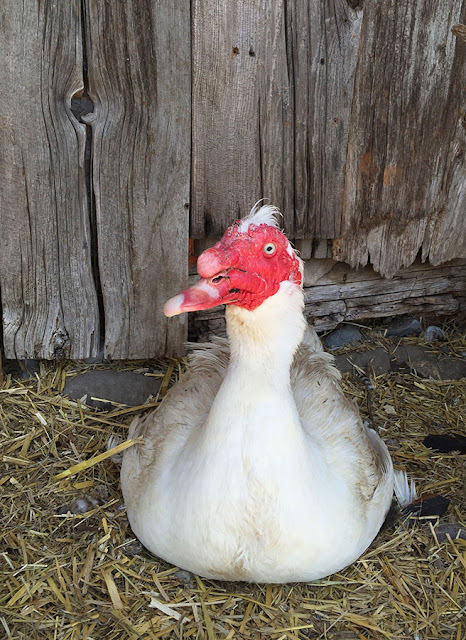 He went peacefully after a long and happy ducky life. We wish he'd had more time with us, but it was not to be. They have fit in wonderfully well! ...Ducky. He is slightly deranged. Doesn't quite fit in, but we love him anyway! The girls are named Nelli, Pulmu, Alma and Tilda. Their former owners took WONDERFUL care of them. Their first human mama is Finnish, hence the names. The girls are a delightful addition to the farm. And next we have Archie and Annuk! ...are going nowhere. I've broken down and made them file folders for their health records, so they are now officially members of the Rowe Campbell menagerie! Here's Archie and Annuk in Greece in April. 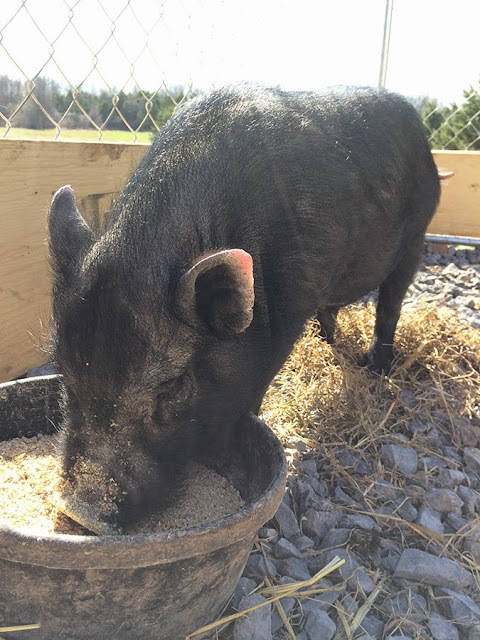 Rudy is a pot-bellied pig who was dumped in a ditch near here in February 2015. A passing OPP officer noticed him and pulled over. 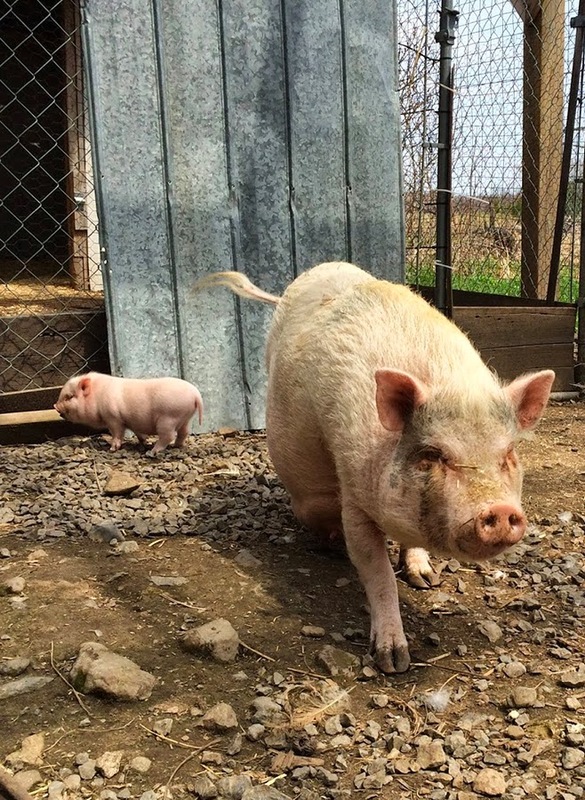 He put the pig in his squad car and phoned our OSPCA shelter in Cornwall to let the manager know he was bringing in a pig, but that the pig looked hungry, so he was stopping at Tim Hortons first to get him a cheese bagel... which he did! 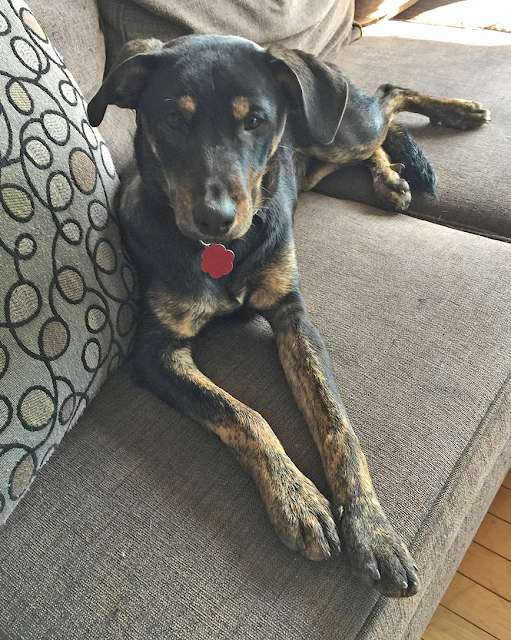 Rudy had to stay in foster care until spring, when we could take him in. It was bitterly cold in February and he had suffered frostbite to his ears and tail. Sadly, the end of his tail dropped off soon after we got him. He has fattened up since this photo was taken and has now established himself as top pig in the herd! He's very sweet and loves belly rubs. SAUL the donkey arrived! He belonged to neighbours of ours down the road. They have a wonderful herd of donkeys. 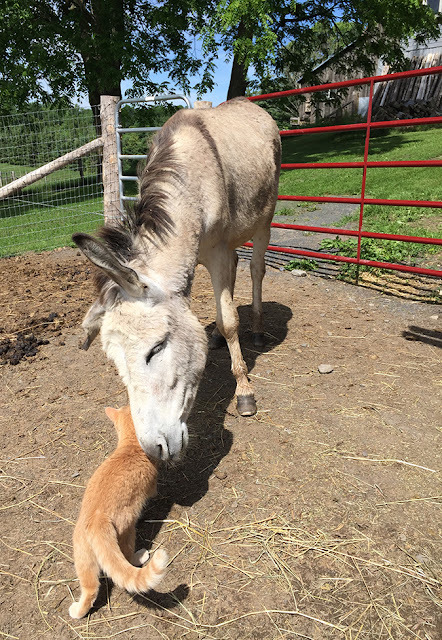 He's not really a rescue, as his owners would have kept him forever if necessary, but Saul and the other alpha male donkey there weren't getting along, and it was a pain keeping them separated, so his owners were looking for a new home for him. We were happy to take him in! Saul was born in 2011. And in July 2015, this fellow started showing up for food! Keaton is about 2 years old, and the rule around here is, kitties who show up get to stay, but no one gets to keep his nuts! 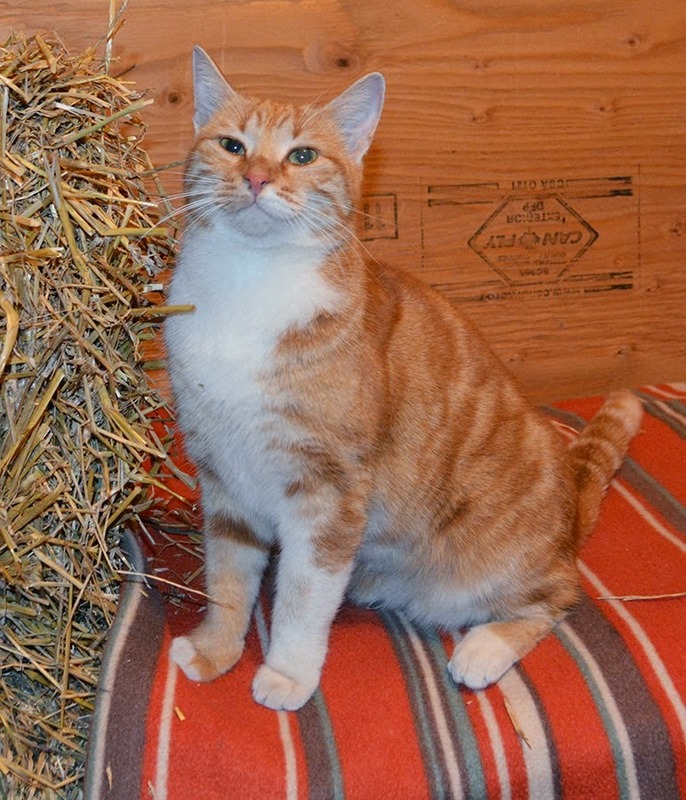 :) We've had Keaton fixed and vaccinated and he has become really affectionate and friendly and is an excellent barn cat. He's super chatty and has a deep, funny meow. On October 2, 2018, we lost Keaton at the tender age of five. He had a huge tumour wrapped around his kidney, and there was nothing to be done. He was the third cat we lost in the space of a year, and it was total heart-break when he left us. 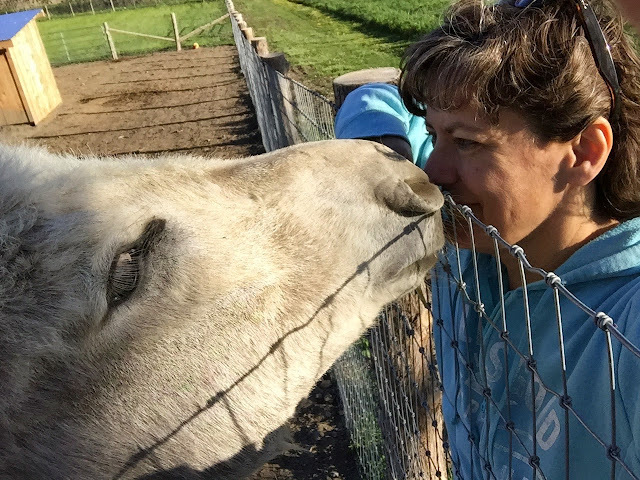 Keaton was the meeter-greeter and mascot of the farm, and it just isn't the same without him. Truly he was the King of Cats. I bought Roo, a quarterhorse gelding born in May 2006. He's a handsome devil! 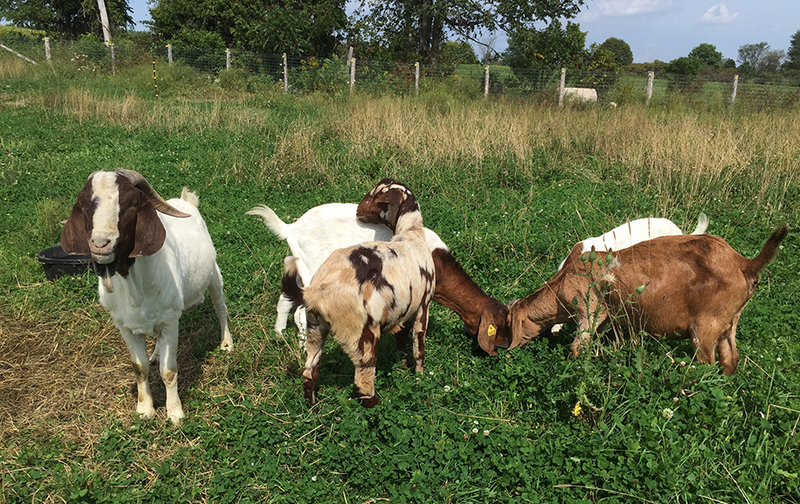 On August 31, we added six goats to the family. They were also adopted via the SD&G OSPCA. Two Boer bucks, a Boer doe, two Nubian does and a Nubian/Boer doe. The other buck is named GEOFF, and the girls are BAMBI. GENEVIÈVE, PENELOPE and DAPHNE. They've been a great addition and are a lovely, if slightly odiferous, bunch of animals. Welcome HENRY! Henry is about 5 years old. He used to be a house pig, but his owners were forced to give him up to the shelter, so he has come to live with us. We're hoping he'll integrate well with our herd and get used to living a life more like a regular pig. 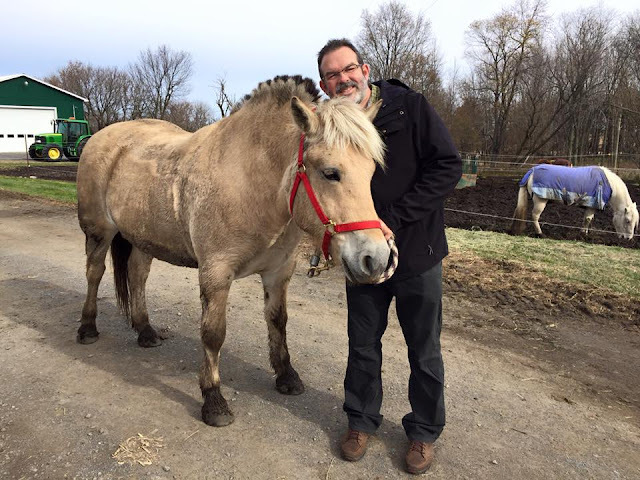 Gordon bought Sandy the Fjord horse mare! We will be learning to drive her this winter. ... is Mimi. She showed up at my friends' place, cold and starving. They have cat allergies, so they couldn't keep her. So here she is! ...is Monty the Maremma. 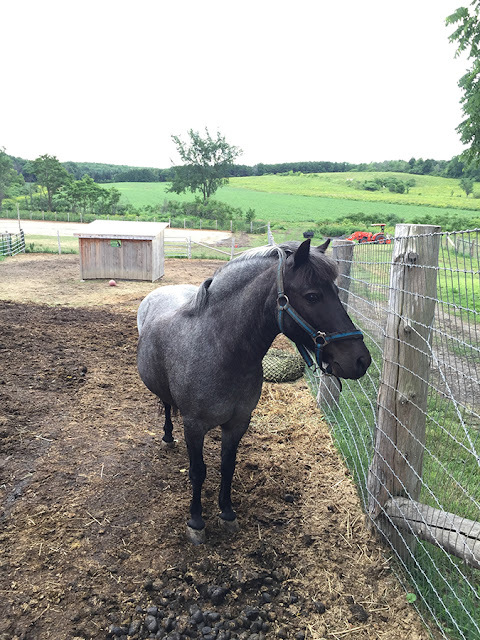 He arrived at the farm on June 7, 2016. His birthday is February 15, 2016. Monty is one of the few animals here who ISN'T a rescue. 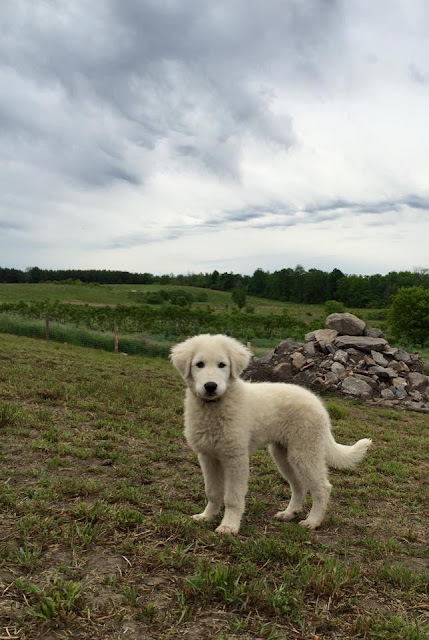 We got him from a responsible breeder who breeds Maremmas specifically as livestock guardian dogs. Monty is here to guard our goats. He will take two years to mature fully, but already he has wonderful instincts, and is just a laid-back, loveable guy. 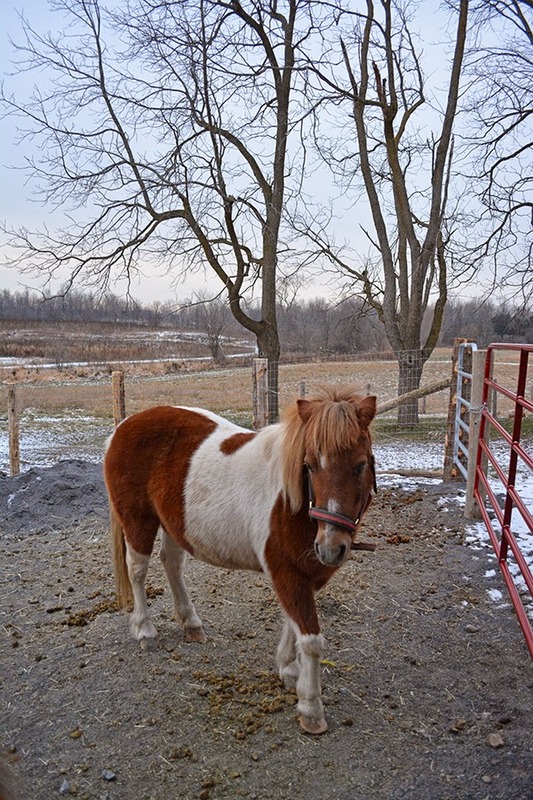 This is Jimmy the Shetland Pony gelding. He arrived July 16, 2016. His owners could no longer keep him, so he has come to live with us. He was born in 2001 and has a lovely temperament! He came with a two-wheeled cart and a child's saddle, so at some point we will be testing him out for riding and driving. He has foundered a few times and still needs to lose some weight, but is otherwise a beautiful little blue roan pony. In July 2016, we also adopted Jackie the Pekin duck and her boyfriend Bernie. 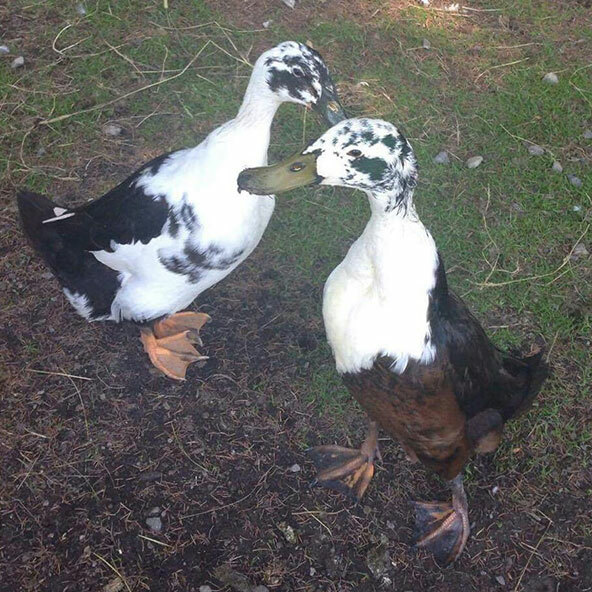 They are two tame ducks who were wandering the streets of nearby Williamstown. The residents were worried about them and were afraid they were going to get run over, so they now live here. July was a busy month. On July 24th, we added two more cuties to the menagerie, both from the Société protectrice des animaux de l'Éstrie in Sherbrooke Quebec. He is an Alpine goat who was dumped at the shelter in poor shape when he was a week old (he was born around May 15/16.) The shelter's vet, who has kept goats herself, nursed him back to health and let him drink milk off her own goat. Bert was dumped with a younger kid, and we were set to adopt him as well, but sadly he died suddenly just before he was to come here. He was in worse shape than Bert and had more health issues to overcome. But Bert is doing very well and is a sweet little guy! Patrick loves a good mud bath! Patrick had gone through SIX homes and was in foster care for a year before moving here! At one point he was owned by a university student who obviously could not commit to Patrick's care. 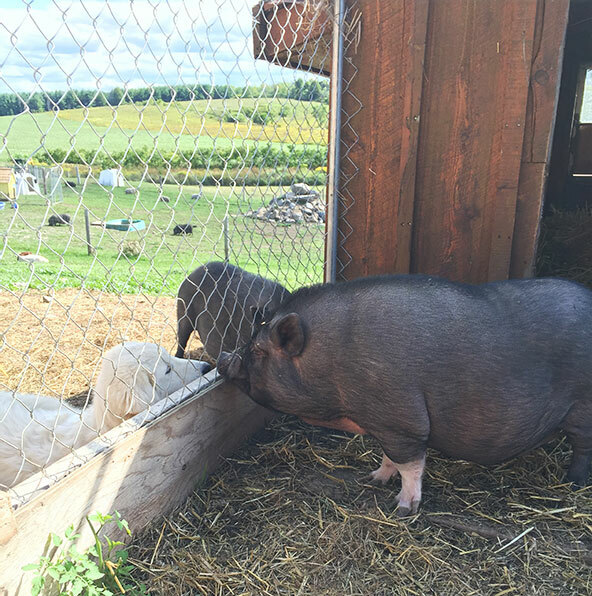 Patrick has found a place in our herd of pigs, and has made friends with Henry and Jersey. He's a sweet little guy who is about a year old,and still has some growing to do. We are happy to have him here. He was born sometime in 2015. Romeo & Juliet arrived in July 2016 too! 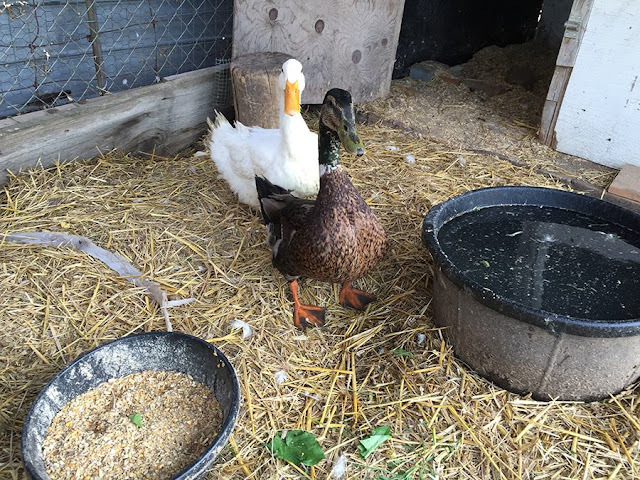 They are a sweet pair of Runner/Pekin duck crosses who needed a forever home. So here they are. They are definitely the smallest of our ducks, and very cute. Gracie was born in 2010. She was surrendered to the OSPCA. She apparently spent some time living in a house, then was banished for five years to an outside to a filthy, junk-filled pen. She had been living on Ol' Roy dog food, Triscuit crackers, and reconstituted pea-soup mix. We are hoping that she won't suffer long-term health effects from this completely inadequate diet. Fortunately, she polished off her first bowl of pot-bellied pig food. We have it custom-mixed at our local organic feed mill. 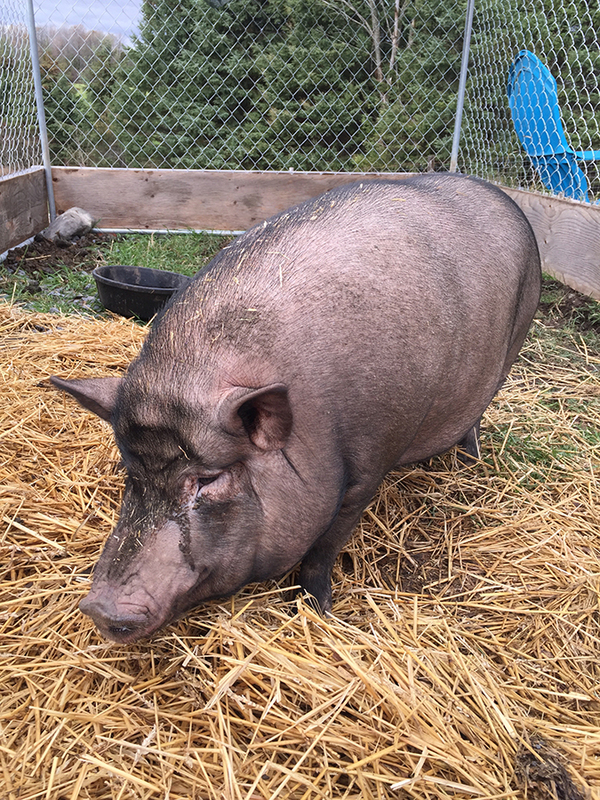 Gracie was extremely overweight when she arrived, which can lead to blindness in pot-bellied pigs, and is also very hard on their joints. But she has lots weight and is now able to walk without getting out of breath or having to lie down to recover. Her weight when she arrived was estimated at 275 - 300 lbs and to move her from the OSPCA truck to her pen (in a crate), we used the tractor with a pallet and forks. Gracie is a prime example of how animals can suffer when people obtain pet pigs without doing thorough research into their needs. 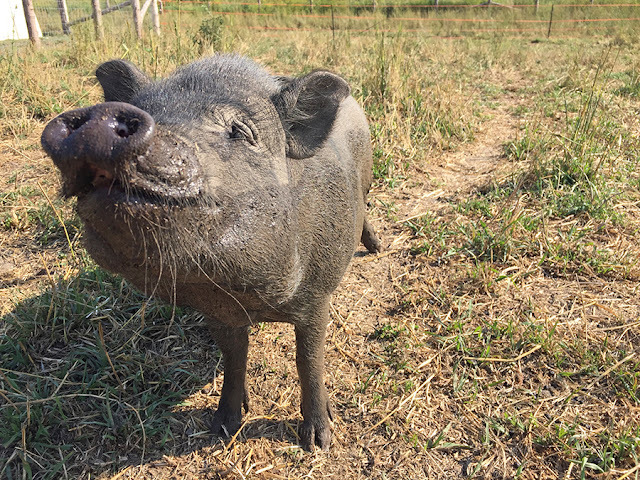 Gracie has integrated seamlessly into our herd and is living a happy piggy life here, with appropriate food, four acres of pasture, and lots of rooting around and rolling in mud baths. And she still gets a Triscuit as a treat every once in a while! 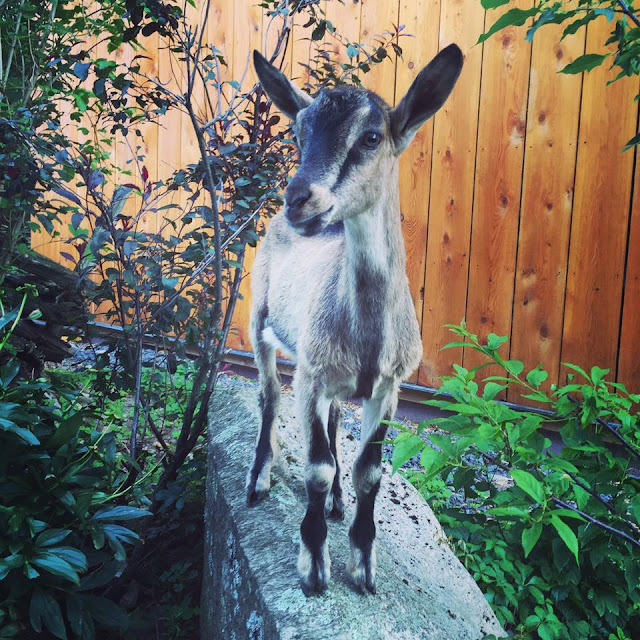 On September 9, 2016, we welcomed Millicent to our farm! This sweetheart of a cat sticks her tongue out and drools when you pet her. Millicent was abandoned at a nearby farm when her elderly owner was sent to a nursing home. 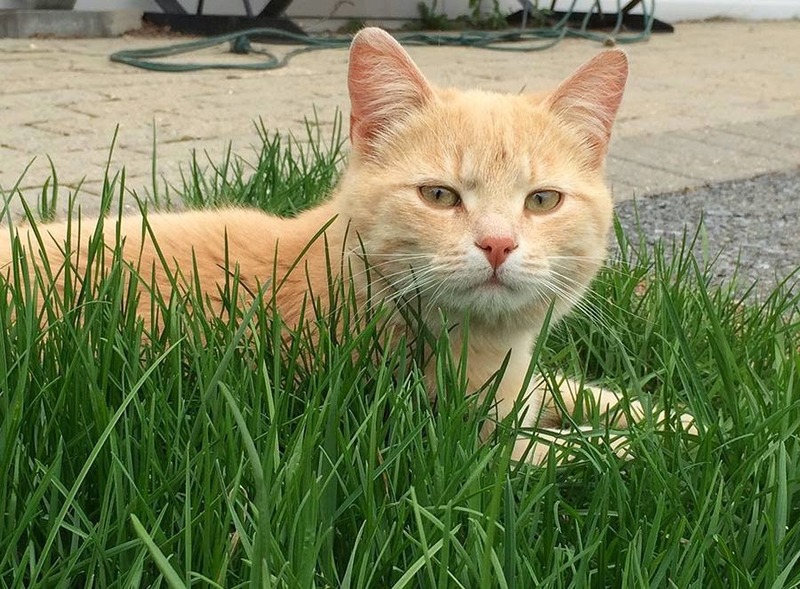 Sometime after that, another neighbour noticed a starving cat at the empty property and began feeding her. Over the next three months, this woman (a senior citizen herself) fattened Millicent up nicely, but she couldn't offer her a home, so she asked a mutual friend of ours if Gordon and I would take Millicent as a barn cat. She kindly offered to pay for her spay surgery as well. So now Millicent moved in. 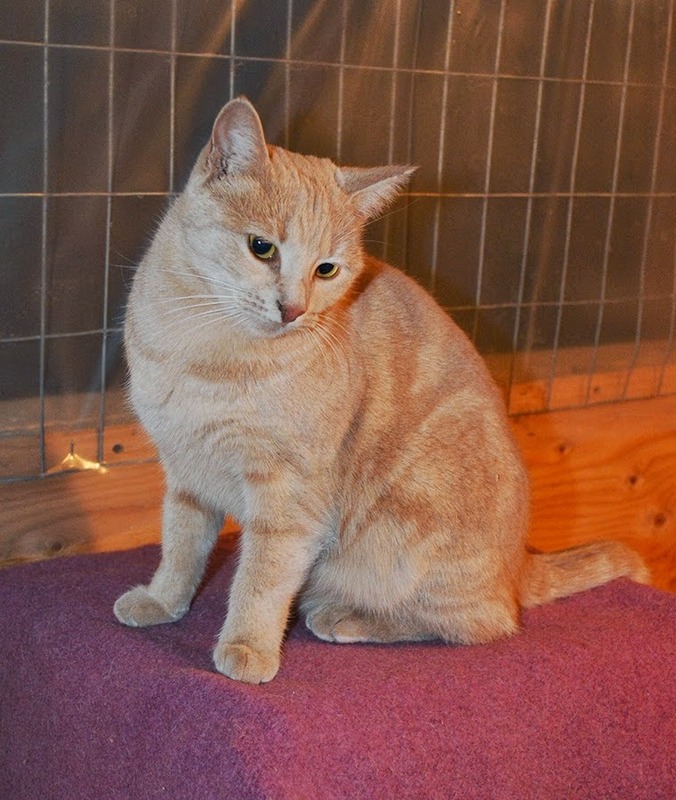 She is very shy but she is also very affectionate, and loves to be cuddled. She has been slowly coming out of her shell, but when humans have left you to starve, it takes a while to trust them again. 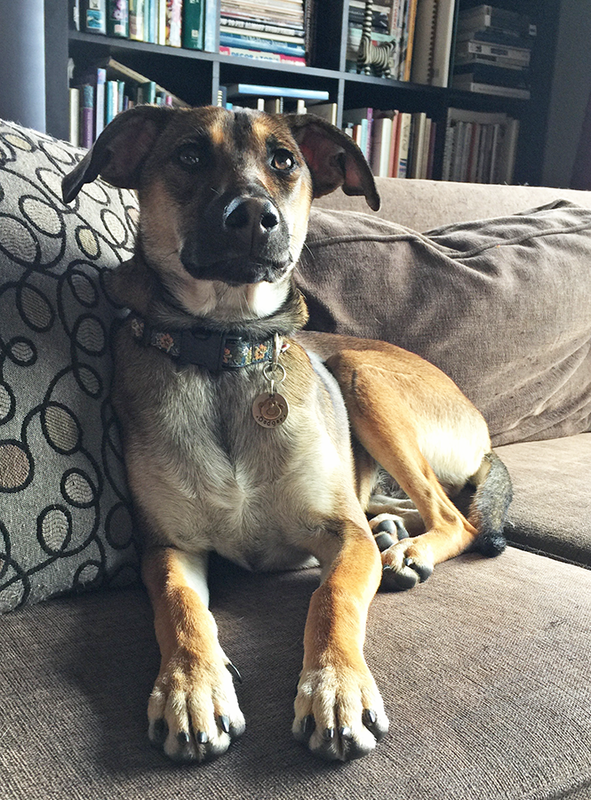 We couldn't be happier having Millicent with us. She was born sometime in 2015 and that mark on her forehead is a patch of grey, not dirt. And Millicent broke our hearts on September 24, 2017 when we had her euthanized at the age of three or so. She had a huge, inoperable tumour in her abdomen. Her life was cruelly cut short and we will never forget her. I'll always be grateful for having a year to love her, but I wish it had been longer. These two special puppies came to us via Eastern Ontario Potcake Rescue, an organization that finds homes for pups from Jamaica, the Turks & Caicos, and the Bahamas. Both of these dogs had a very difficult start to life in Jamaica. 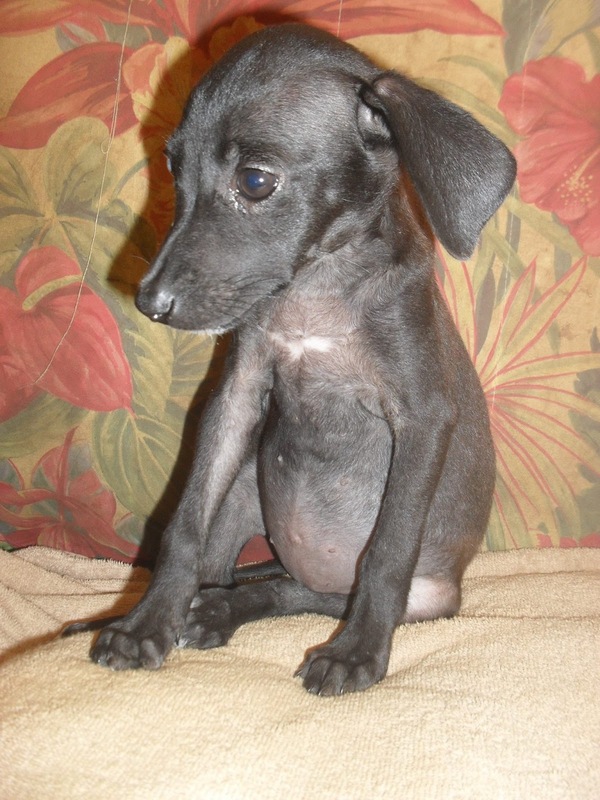 Chloe was found as a tiny emaciated puppy. Initially they thought her legs were broken because she was unable to walk, but it turned out she was just malnourished. 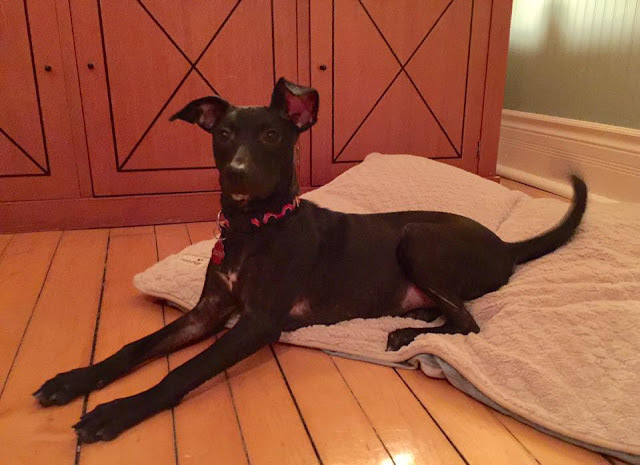 With medical care and TLC, she has recovered completely from her rough beginnings and now runs like a whippet. Dodger has an even sadder story. He was left for dead in a ditch after being hit by a car, his rear left femur shattered. You can see the long scar on his leg in the photo above! Fortunately, some kind person rescued him and took him to The Animal House Jamaica, where he underwent surgery to insert pins in his broken bone. Dodger needs more physiotherapy and may possibly need more surgery at some point, but right now, things look great. When you see him tearing after Chloe, you would never know he'd suffered such a traumatic injury to his leg. 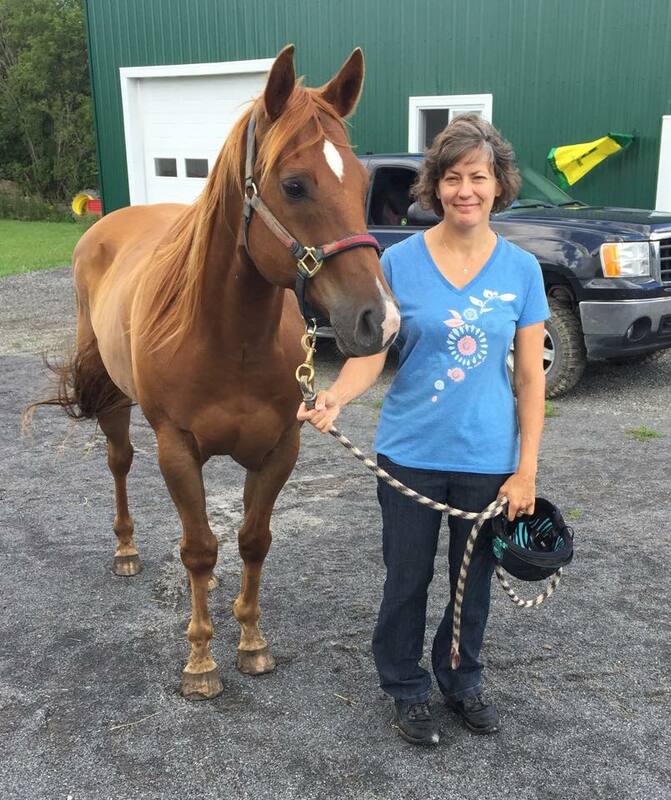 Chloe and Dodger were both brought to Canada by Julie and Allison, the wonderful women who run Eastern Ontario Potcake Rescue. They were fostered for some time and bonded in care. On October 29, 2016 we adopted them both. They won't be big dogs, maybe 40 - 45 lbs at maturity. We could not be happier with these two, They're cuddly, friendly, athletic, fun-loving dogs with beautiful temperaments. Lucky us! We were supposed to foster Gigi for a week or two, but instead we fell in love, so on December 27, 2016, Gigi joined the family. Gigi when she was rescued. 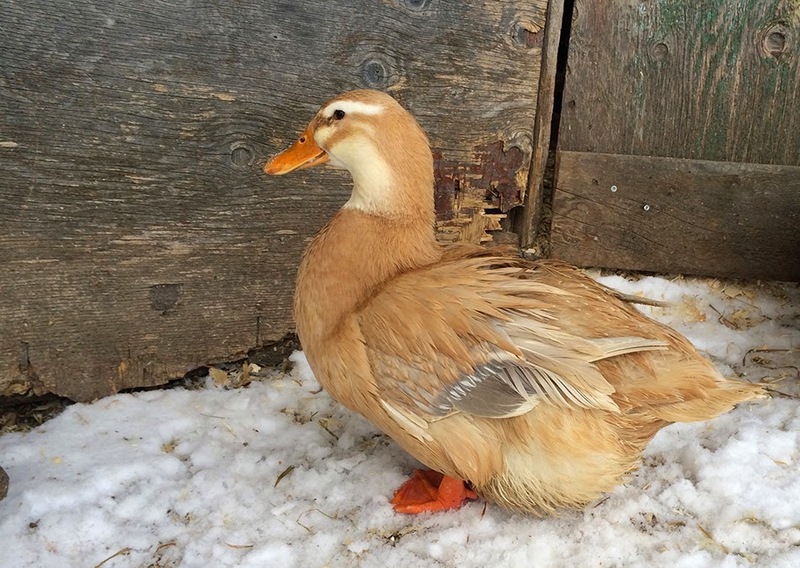 She was taken The Animal House Jamaica, and from there flown to Canada by Eastern Ontario Potcake Rescue. The rest is history! We are thrilled to have here. She's sweet and loving and a blessing to have around. 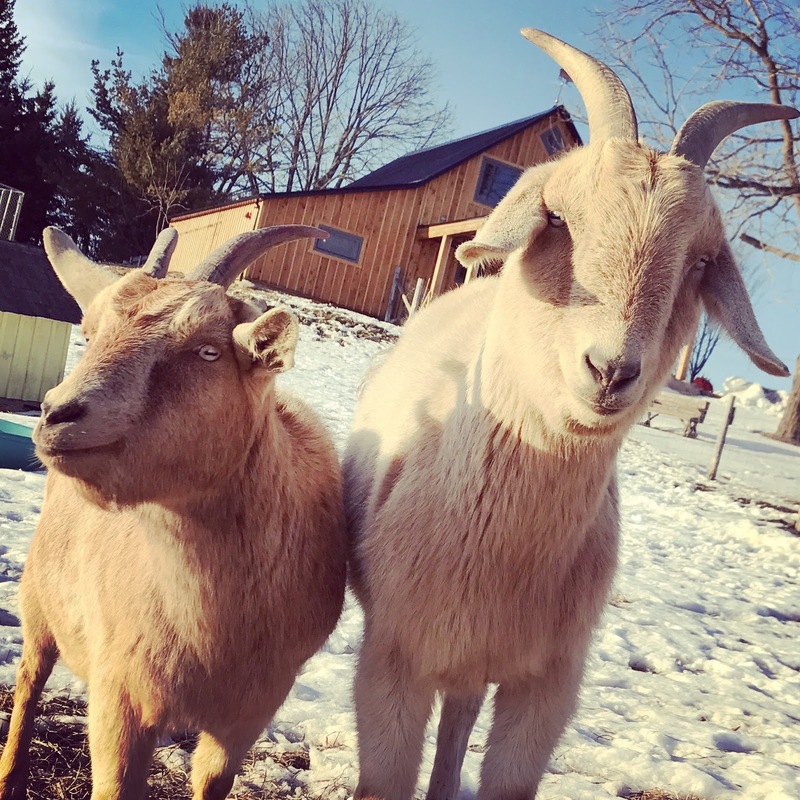 These two delightful Pygmy goat boys joined the herd on January 18, 2017. Their owner couldn't keep them anymore, but they were well cared-for and well-loved. The boys are brothers born on Valentine's Day, 2012. 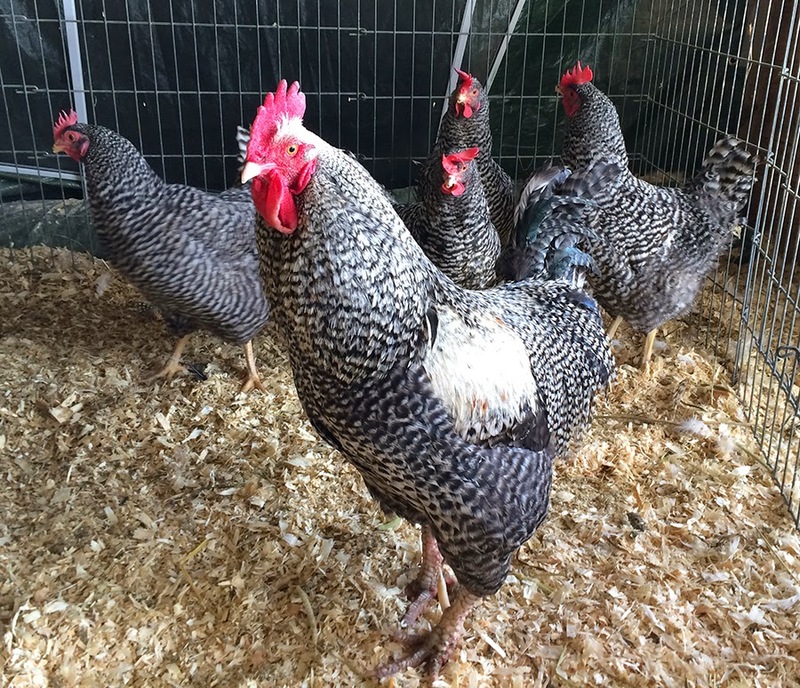 They have calm, sweet personalities and beautiful markings. Pepper is bolder than his brother Salty! 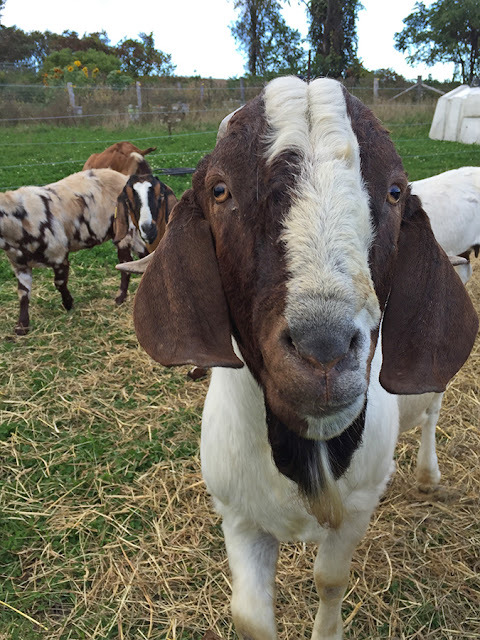 They have befriended Bert the little Alpine goat and like to hang out with him around the hay feeder. They were super-cute as babies, too! 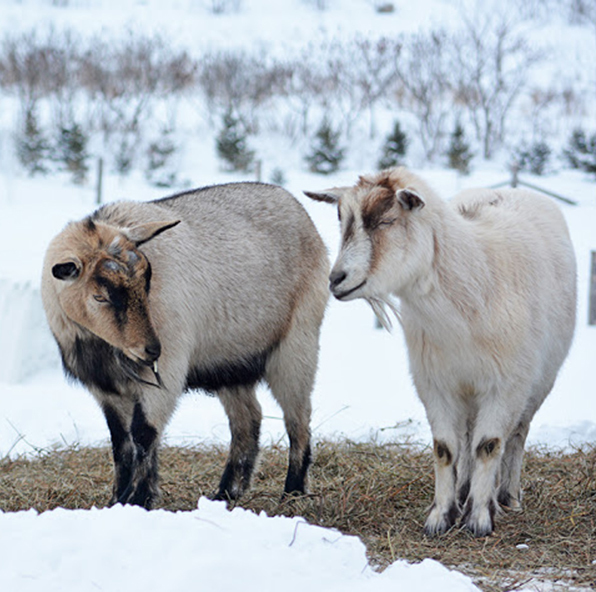 They are a lovely pair of Pygmy-Nubian crosses, a sister and brother born in 2014. Ninja is quite protective of his sister, but both of them are super-friendly and love to interact with people. Still, we can't help but wonder how Ninja got his name! These two immediately befriended Salt, Pepper and Bert the day they arrived. Cindy has beautiful blue eyes. 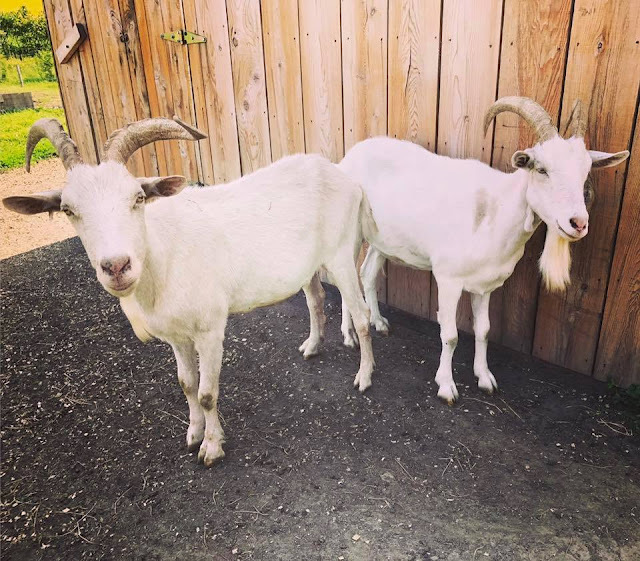 Both of these goat were in good shape when we got them and had been well looked-after, but their owner needed to find them a new forever home, so here they are! They have magnificent horns that they use for good, not evil. Update... Sadly, we lost Ninja in the spring of 2017. We still don' t know what happened. He seemed fine, then one day I just found him stretched out in the goat pen, gone. It was a very sad day and I'm sure Cindy misses him. We wish we could have had him longer... Ninja was a lovely addition to our herd. Stay tuned for further additions, because there will no doubt be some! Oh my God... I forgot all about Gordon.. I thought a gentle reminder might be appropriate. When you get to the chickens you could make him top rooster. This is the first time I saw this page! Love it. All the animals are wonderful! Such a big animal family, they are so lucky to have found such a wonderful home. Each one is a special character, so beautiful to see this. Are you far from Augusta Maine? About a seven hour drive, I think! Bless you for giving all these wonderful creatures a good home! This is the first time I have visited your blog, looking forward to many more incredible reads. Hi there!! I am an early childhood educator in a kindergarten classroom in Cornwall. 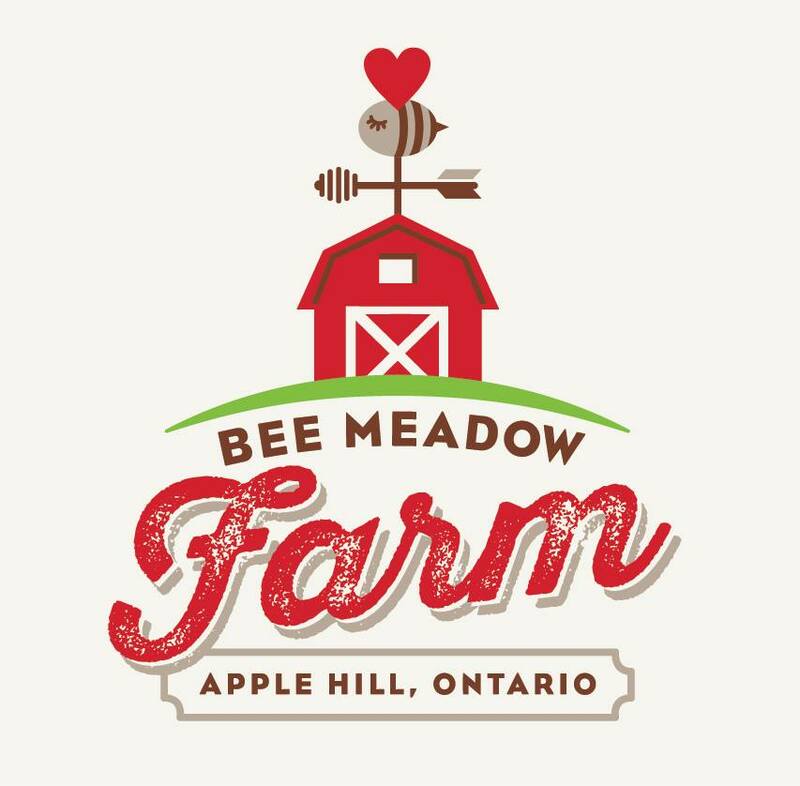 We are looking for a farm to bring our class of 29 for a visit surrounding our farm unit this spring. Can I reach you by email/facebook for some information? You're farm looks like so much fun!!! I applaud you and Gordon for adopting and giving all these sweet animals a wonderful home on your farm. We have 9 inside cats, 5 outside and 1 bulldog, which doesn't sound like much, but we do live in town with a limit on how many pets we are supposed to have LOL! If I lived in the country, I would be like you two and have a menagerie. All your animal quarters look so nice, CLEAN, and comfortable for the loved ones. Once they make it to your place, it's no wonder they never want to leave! My question, and the only reason I ask is because I know how it is at my house, how do you keep your house picked up when you have so many to take care of outside? I swear, sometimes I feel I need an extra set of hands to keep things tidy! It's a fulltime job taking care of mine! On another note, I just love Joan and her rescues. I fund a kitty through her, kind of an adoption but he lives there with Joan. His name is Mickey. I wish someday to really meet Joan and her tribe. She, like you, has a huge, sweet, caring heart. You will not be disappointed if you get the chance to meet Joan. Loved meeting your cast of characters! It looks like everyone has a wonderful home with you. Vegans don't talk about it much but the combine harvesters that gather much of their plant foods kill thousands upon hundreds of thousands of field mice, voles, nesting birds etc. etc., and in greater quantities than are killed to sustain meat eaters. Living without killing is not possible, sadly.